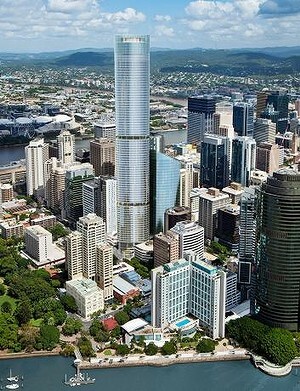 After years of false starts, Brisbane’s tallest skyscraper finally looks set to get off the ground. The 90 storey Vision Tower, planned for construction between 111 Mary Street and 222 Margaret Street in Brisbane's CBD, will be the third highest building in Australia, if a development application lodged with Brisbane City Council last week is approved. Not sure why that article represents it as the Vision Tower. Vision Tower died a long time ago and the site was sold...this is a totally different development with two towers named 111 Mary and 222 Margaret. There really is little connection except the similar desire to build a large iconic tower. yeah, it'l be amazing to see the redeveloped subway station under it too....sorry.....wrong city..... OK, well the shinny new bus stop out the front then!